Life is full of precious moments we sometimes forget. 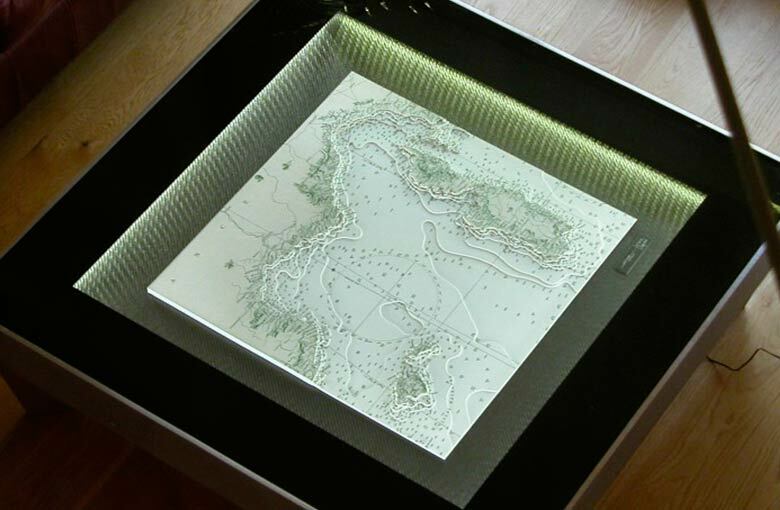 A picture can capture a memory but a 3D or light chart can capture the location of that memory, thereby allowing us to display it in a unique way that gives it pride of place in our living space. 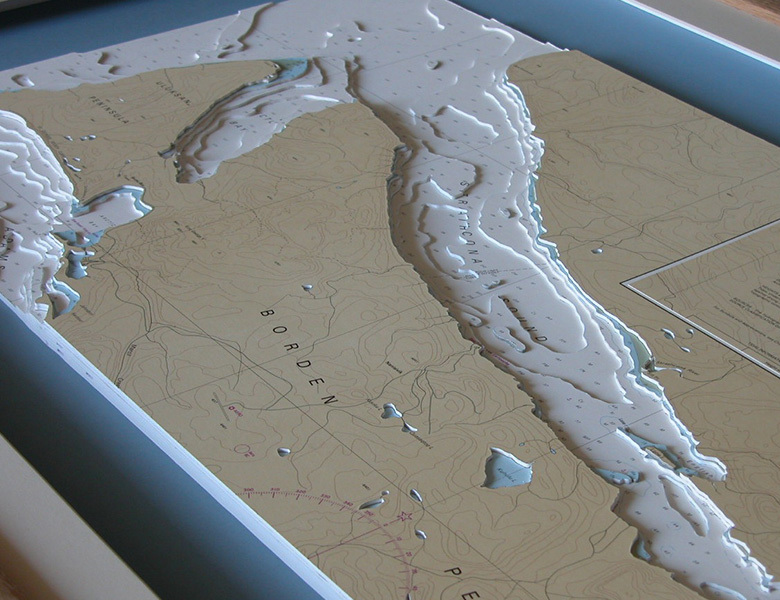 Using any Nautical Chart, the coastline and seabed are layered to show contours and depth in three dimensions. 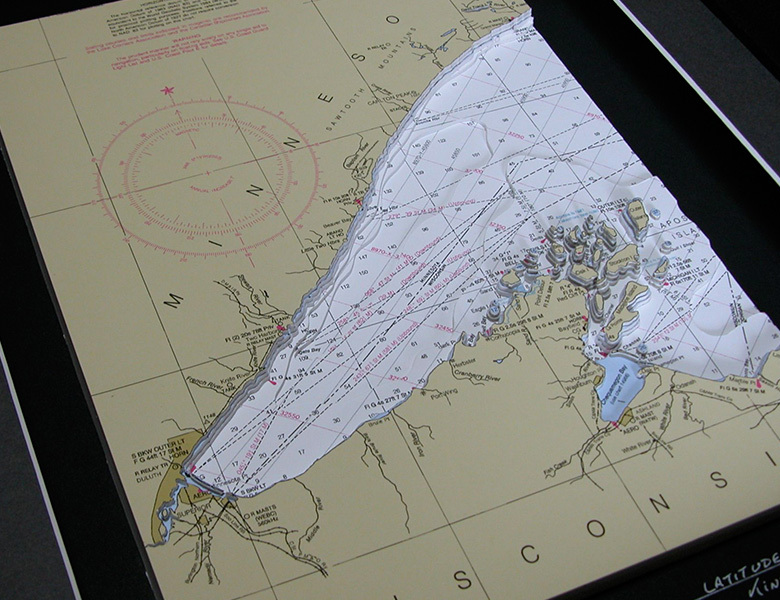 Each 3D Nautical Chart™ is painstakingly hand-cut and assembled to create a truly unique piece of art. 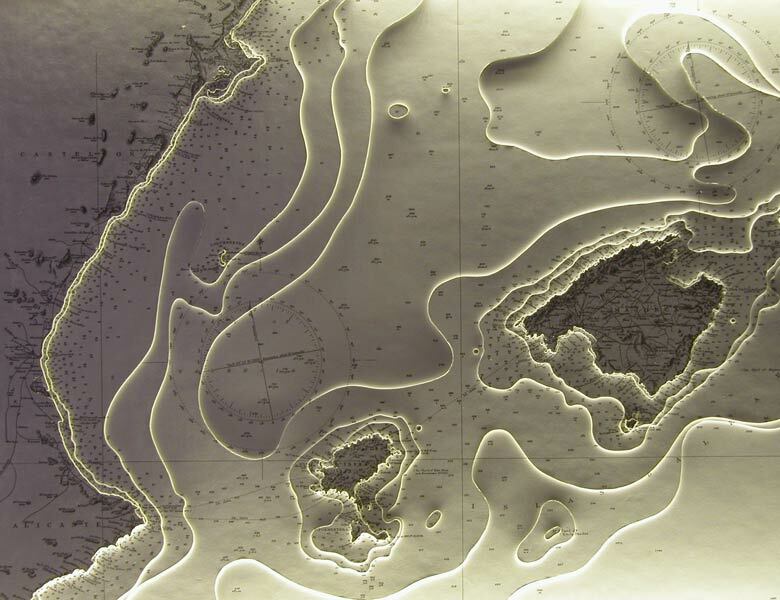 The 3D effect enhances the nautical chart and physically illustrates a key attribute of any chart – depth! 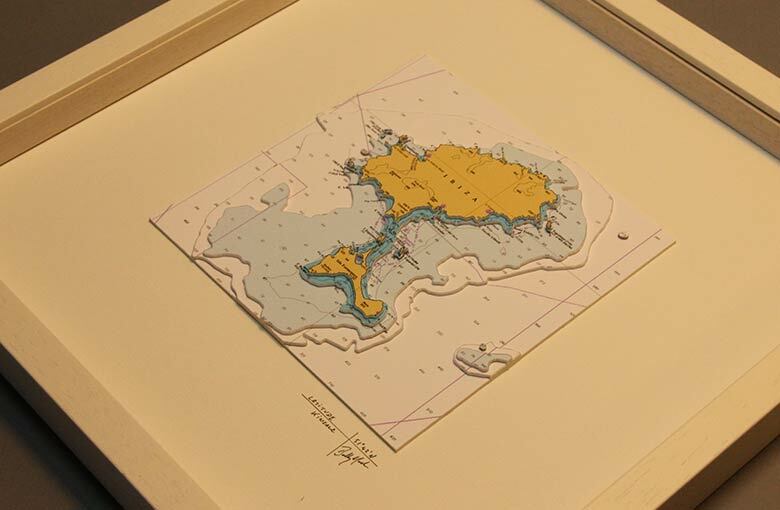 The framing and presentation has been carefully designed to maximize the 3D effect. 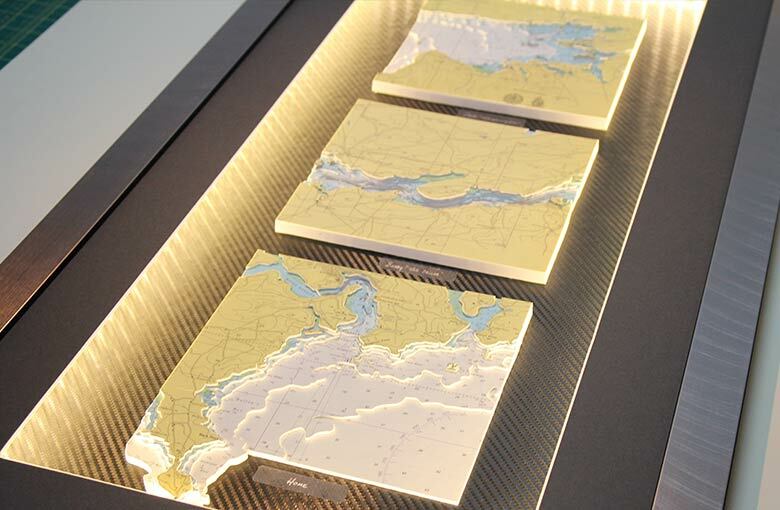 Surround lighting built into the frame enhances the relief and is a key feature in any setting whether at home or on a boat. Any chart anywhere in the world! 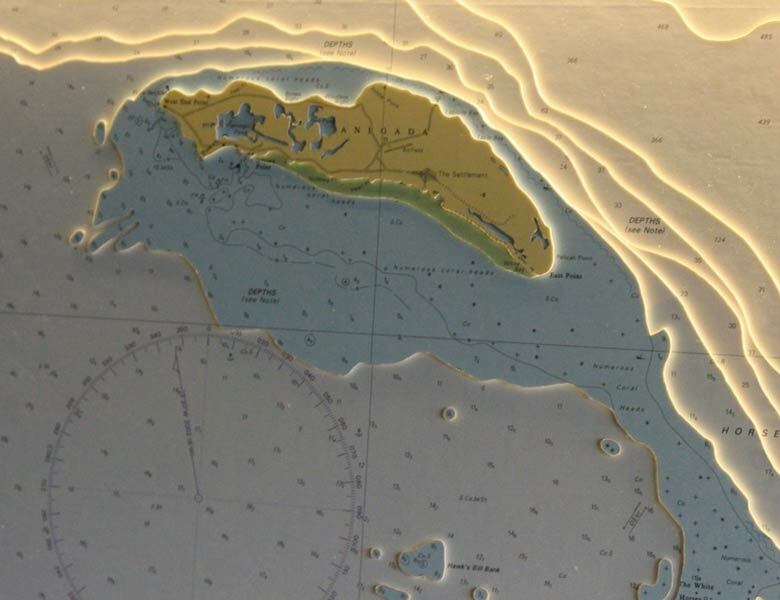 Using Nautical charts of your selected coastline, we create a relief 3D chart showing the various depths and coastline contours. Beautifully framed, the chart is transformed into a timeless piece of art. A Touch of Class. Our classic black and white charts are timelessly elegant. The historical aesthetic of these archive charts blend seamlessly with our contemporary design and offers the discerning customer a piece of art that exudes sophistication. Creating bespoke furniture in the form of Chart Tables. 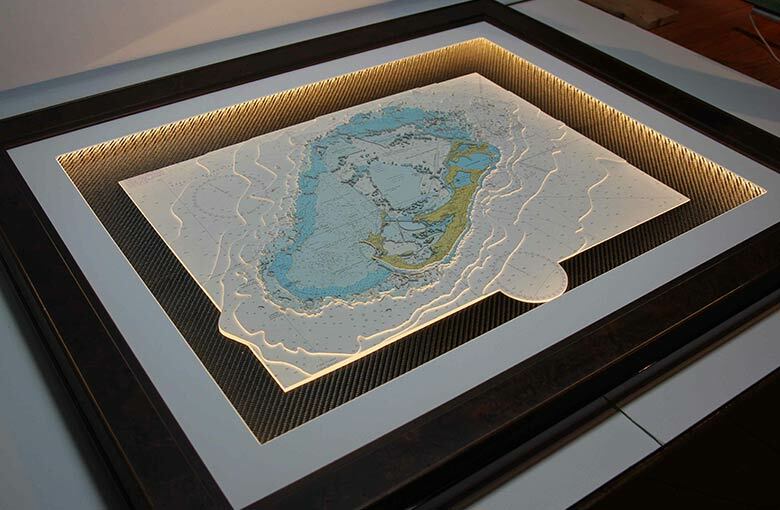 Latitude Kinsale combines its creative talent by embedding a 3D chart under glass in a truly unique piece putting your own personal stamp on a piece of fine furniture. The tapestry of life tells a unique story. Our storyboard charts allow the opportunity to combine multiple chart locations within one frame. Each location is displayed in a separate aperture. Each picture tells a story. What is your story? 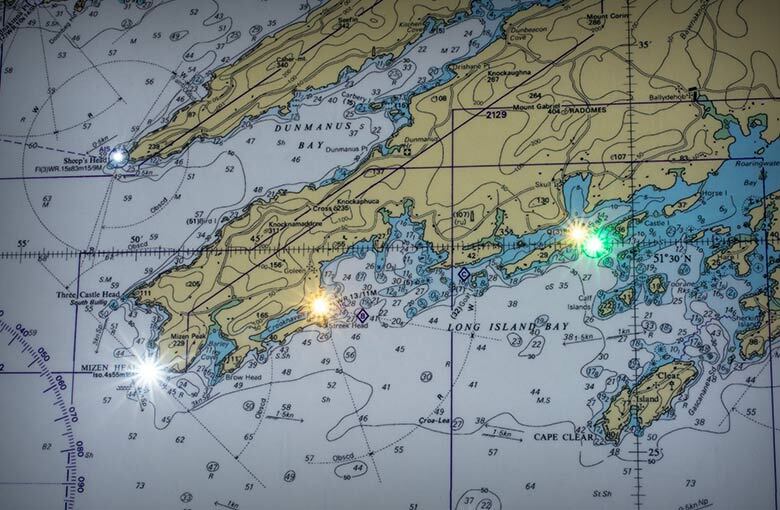 Adding a new dimension to charts, the lighthouses & navigation lights flash to the correct sequence & colour. A micro controller and unique optical system illuminate the chart lighthouses accurately. Our new budget Origins range captures the essential elements of our craftsmanship and design. They are already proving very popular in the giftware market. The ideal choice for someone who has everything – whatever the occasion. 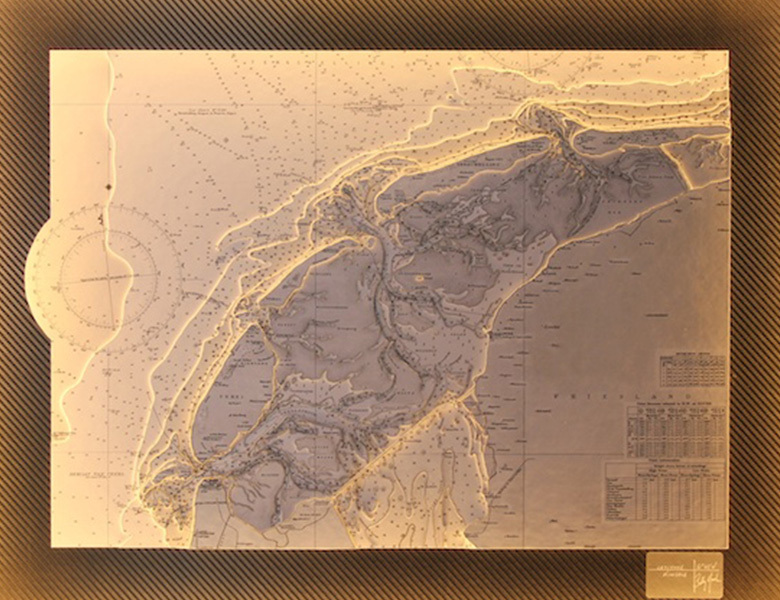 Hand gilded 24 Carat Gold leaf using our worldwide portfolio of nautical charts. 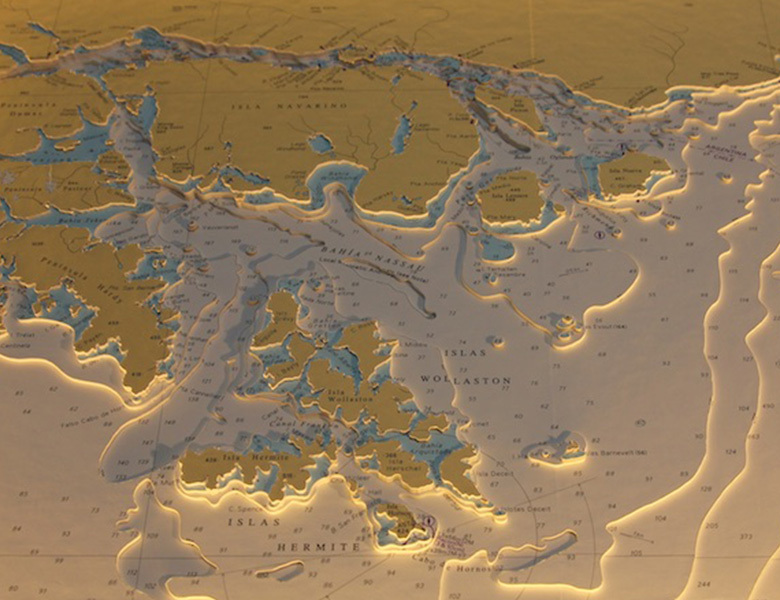 Using the gold as a backing onto which we print the nautical chart. The eﬀect is stunning. 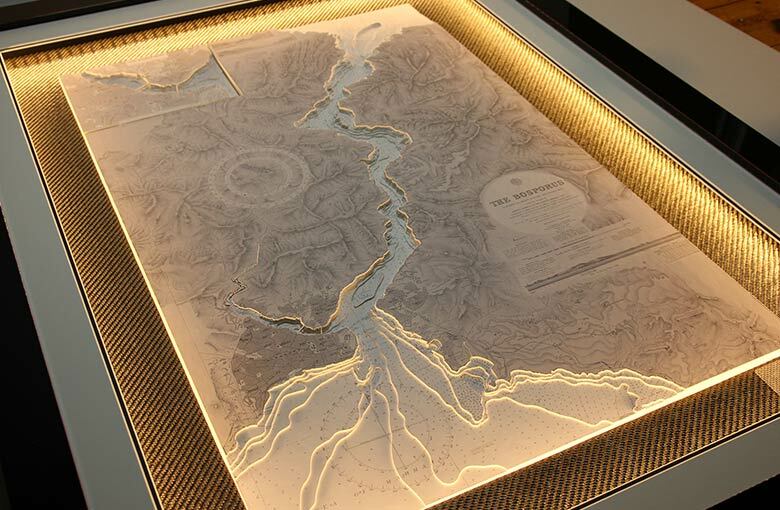 The land is displayed as gold with the text in black ink . 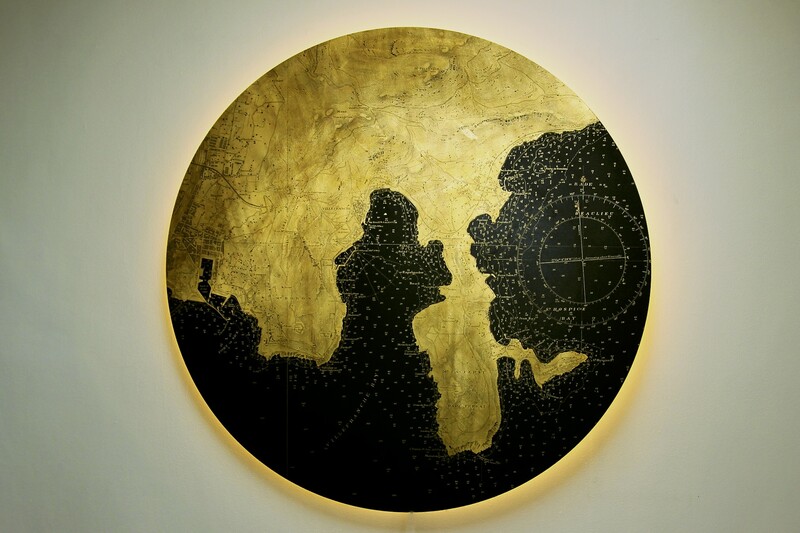 The sea is black with the chart depth details in 24 carat gold leaf. The detail is exquisite. The piece can be designed to any shape and size. The base is a rigid aluminium composite, the size can be scaled up to as large as 1.5M in diameter. Any Coastline anywhere in the world! We have a variety of gift cards available to you. All you need to do is head to our shop and select the gift card you like and we’ll send it to whoever you like. The sea and coastline evokes a special emotion in people, we connect to it in different ways, vacations, recreation or simply taking a walk by the sea. We all have our favourite location, full of memories & precious moments. So why not capture them in a personalised 3D or Light Chart and preserve the memories for generations. In these modern times it is difficult to find something as unique and personal as the products and services that Latitude Kinsale provide. Latitude Kinsale is an innovative company that delivers a high quality product. Ideas like multiple 3Ds within one frame that tells a story, or furniture with a 3D chart embedded under glass, demonstrate Latitude Kinsale’s ability to deliver something special and yet very different. See below a selection of locations taken from our Portfolio. Explore our vast portfolio of charts our clients have commissioned to inspire you! Subscribe to our newsletter to get the latest news from Latitude Kinsale.